This vintage album contains a mix of mostly good tracks that are very well played. Freddy King was a blues artist that influenced a number of Southern California surfbands in his day, such as The Lively Ones. He was a superb musician, but often played fairly jammy material. Bouncy blues jam in a Memphis groove kinda way. "Man Hole" is more a guitar exercise than a song. 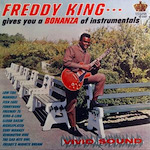 The guitar tone is unusual for Freddy King, and the riff rock structure is perhaps a bit less blues and more rock. Chamber reverb on the guitar gives it an almost surfish edge. Very tasteful. Funky blues riffs and a jammin' backtrack, miles from the surf idiom. Excellent playing as you might expect. "The Sad Nite Owl" is a very slow classic blues jam. Not particularly unique, but very suave. A bit of a barnyard scratcher, "Funny Bone" plays on the chitlin' side of the tracks. It coulda been a Lonnie Mack kinda thing I think. Very fun track. With a backtrack that could have been used for "Shortnin' Bread," this track is just a riff rock jam. Very good playing, but not very interesting writing. The drums are interesting, however. Very much influences by "Honky Tonk," this is a bluesy riff roller with cool rolling piano. Tasteful blues. This is a saucy song with a kind of east LA feel, like a cross between Pachuko Soul and R&B. Groovy and suave, bluesy and fluid. It's on the jammy side, but is pretty durable. This is one slow last dance tune. Beautiful melody line, almost lap steel ready, with a prom beat and plinky piano. Very nice track. Add a little spring reverb, and the islands will be in sight. "Fish Fare" is a slower long note blues, with cool piano and and an aquatic melody line. A bit of the "King Bee" stinging, and some pretty tortured notes connect to create a very cool track. Slow blues groovin on a lazy afternoon in the sun. A cool breeze crosses the front porch. Minimalist, but tasteful and enjoyable.